TOTO creates quality of life through innovation, technology and design. The world’s largest toilet manufacturer is most known for its WASHLET toilet systems, which integrate advanced features for comfort, hygiene and cleanliness. In 2018, TOTO introduced two new WASHLET toilets: the Aquia IV WASHLET+ S550e and the WASHLET+ S500e. WASHLET includes a heated seat and built-in bidet, with controllable settings, hands-free drying, effortless cleansing, and a SoftClose lid to prevent the accidental slam. WASHLET toilets are self-cleaning, automatic-flushing and water-saving. TOTO describes WASHLET+ as the smart way to introduce the comfort and cleanliness of TOTO technology into your life. 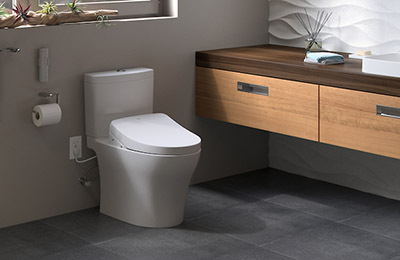 They have taken the already-elegant WASHLET and added the aesthetic appeal of a concealed connection, meaning cords and hoses are not visible, among other enhanced features. Interested in learning more about TOTO WASHLET and other toilet systems that bring the simplistic beauty of design into your everyday life? Schedule a visit to International Bath & Tile, where architects, designers and homeowners alike go for a spectacular showroom experience. Call us at 858-268-3723 or make your appointment online.